Food Report for of October 2016. 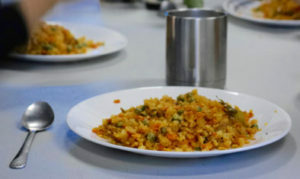 Flattened rice (Poha) – quantity according to the number of people. Step 04: When the mustard seed start popping up, add the chopped onions. tomatoes, all the vegetables the remains of spices. Step 06: Cook the mixture for 10 to 15 minutes. Step 07: Wash the flattened rice with water 2 to 3 times. Note: this step is use to soften the rice. washed flattened rice in the mix. up to taste. I recommend to add a lot of vegetables.